Master baker Mat Hauck of Great Barrington, MA, created this neat little spin on traditional Italian biscotti cookies and generously shared some with your favorite food bloggers (us). They arrived neatly packaged and we couldn't wait to try them. I love to have biscotti with something warm to drink. 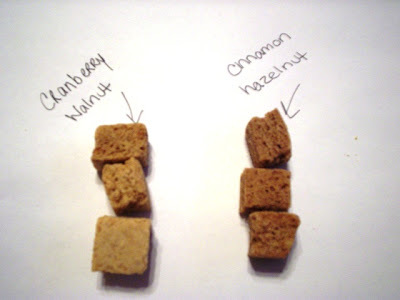 These little healthy treats, all natural, whole wheat based, zero trans fat, and only 100 calories per pack come in four exciting flavors (cinnamon hazelnut, cranberry walnut, double chocolate, and orange almond). We received a package of the first two listed flavors which had six pieces per pack. Baker Hauck has also come out with a line of natural gluten-free cookies also containing zero trans fat. These can be obtained at select grocery stores or online at the address below. First, we opened the cinnamon hazelnut and were delighted with the great cinnamon aroma wafting from the little pack. Laura and I split them so that we each were able to taste three bites. 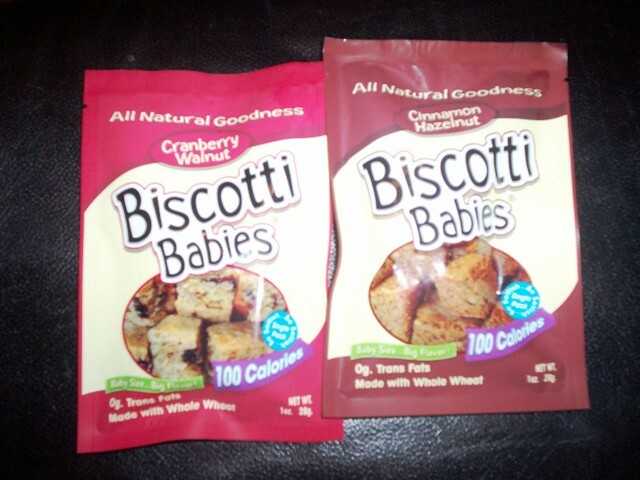 They tasted just like you'd want a good biscotti to taste - nice and crunchy and ready to be dunked into something warm. These particular bites had a great cinnamon taste that actually overwhelmed the hazelnut flavor that was supposed to complement it. But since we love cinnamon, this wasn't a problem for us. What was a little problem was that the second package we opened (the cranberry walnut) tasted neither cranberry nor walnut. They tasted more like a butter or sugar cookie - sweet with a vanilla aftertaste. They were really good but were not what you'd expect from their description. THE VERDICT: I'd definitely buy these tasty little snacks if I ran across them in the market. They're low in calories, natural, and make a really tasty treat. If you can't find them, don't forget, you can order them online. I suggest you do so. Mmm ... biscotti and a nice cup of tea. Yum! For more information, visit BiscottiBabies.com.